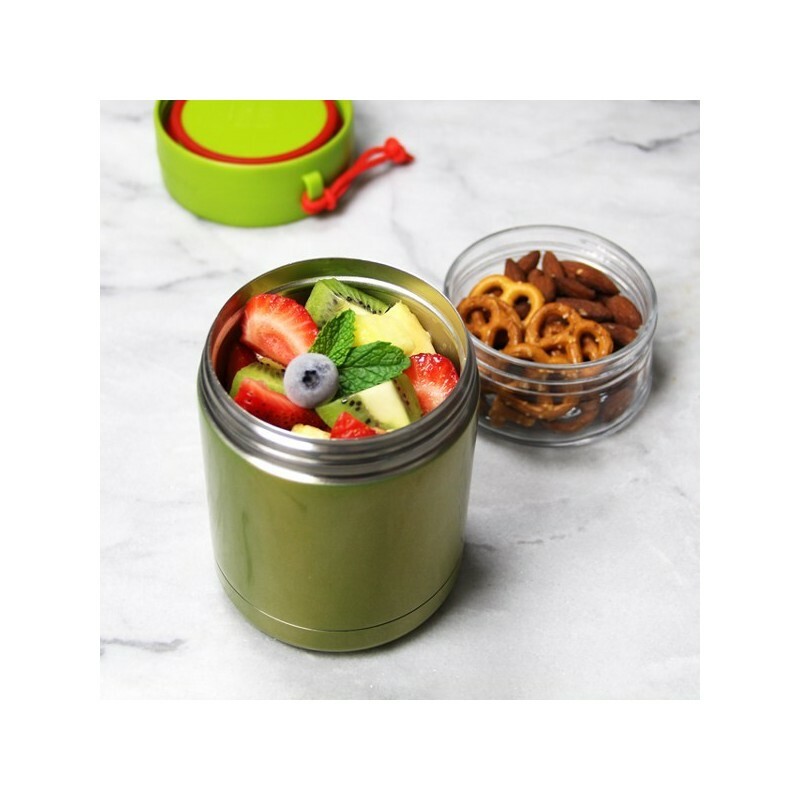 Two-in-one insulated food jar with a 470ml (16oz) stainless steel container plus a 235ml (8oz) glass screw in compartment. Uniquely designed to avoid landfill and be almost fully recycled at the end of its life, unlike most insulated jars! 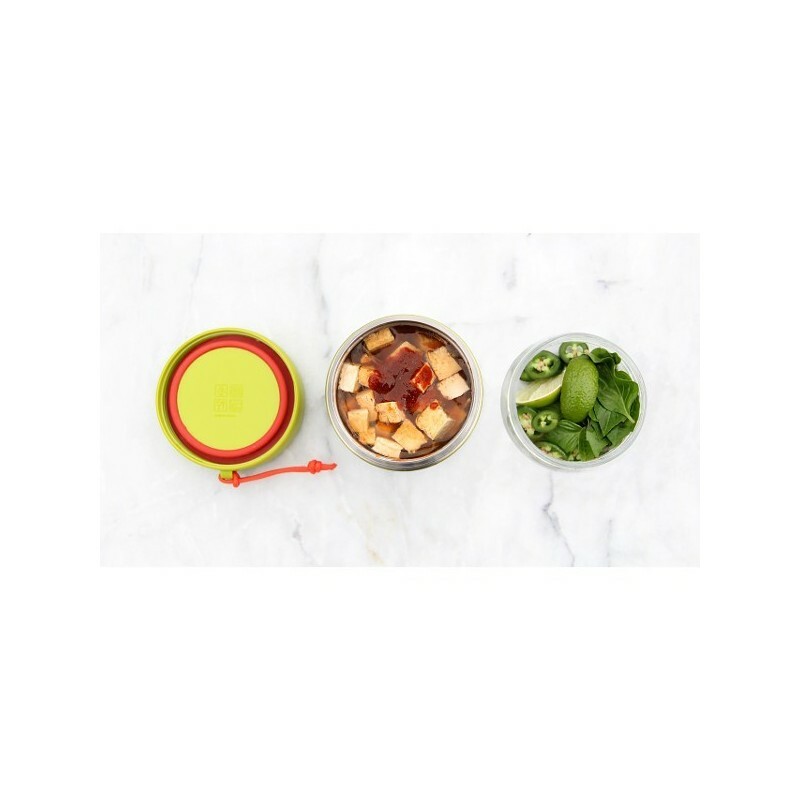 Keeps food hot for 7 hours or cold for 9. Wide opening for easy washing and use. Green colour. 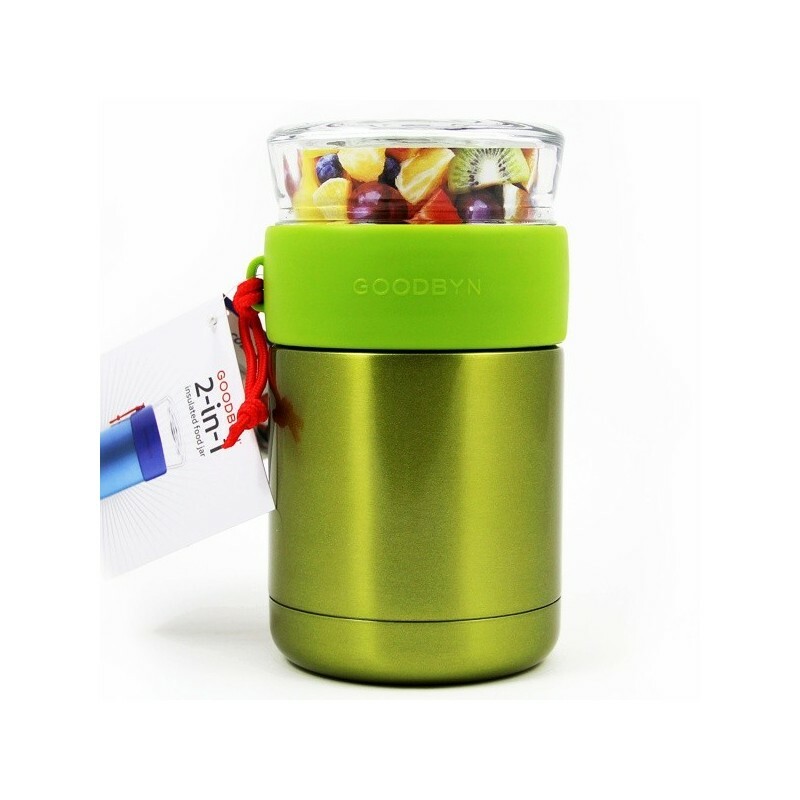 Lid interchangeable with smaller Goodbyn jar. Almost all other insulated jars will end up as landfill because most food jars are made of mixed materials that can not be separated (e.g. plastic glued to stainless steel, cork with stainless). Products that are designed responsbily take a cradle to cradle approach so that the pieces can be disassembled and properly recycled. 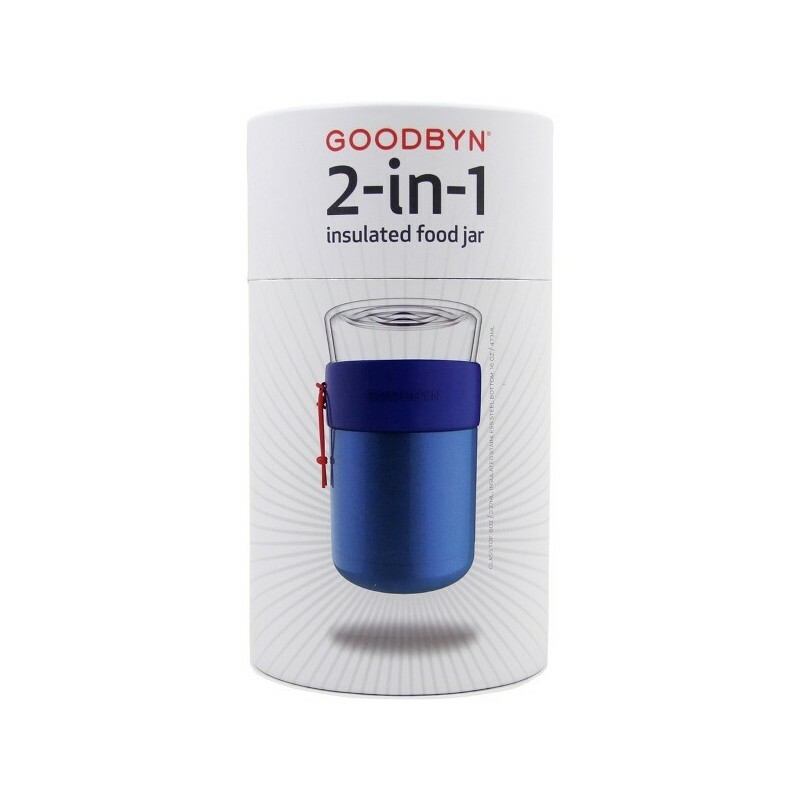 The Goodbyn 2-in-1 insulated food jar was designed from scratch with this in mind. All of the components can be easily taken apart. Only the cord and silicone seals can not be recycled via the kerbside recycling, but they can be reused. Soda ash glass, the same as glass food packaging jars, which can be placed in household recycling (unlike boroscilicate glass which can not). 18/8 stainless steel body. Plastic is #5 PP Polypropylene plastic (the same as plastic used in yogurt containers for the central section that the stainless steel and glass containers screw in to. Can be disassembled and 97% of materials recycled. No toxins or heavy metals used in the plastic. #5 PP is one of the most benign plastics on the market. Parts screw in to each other to make cleaning easy. 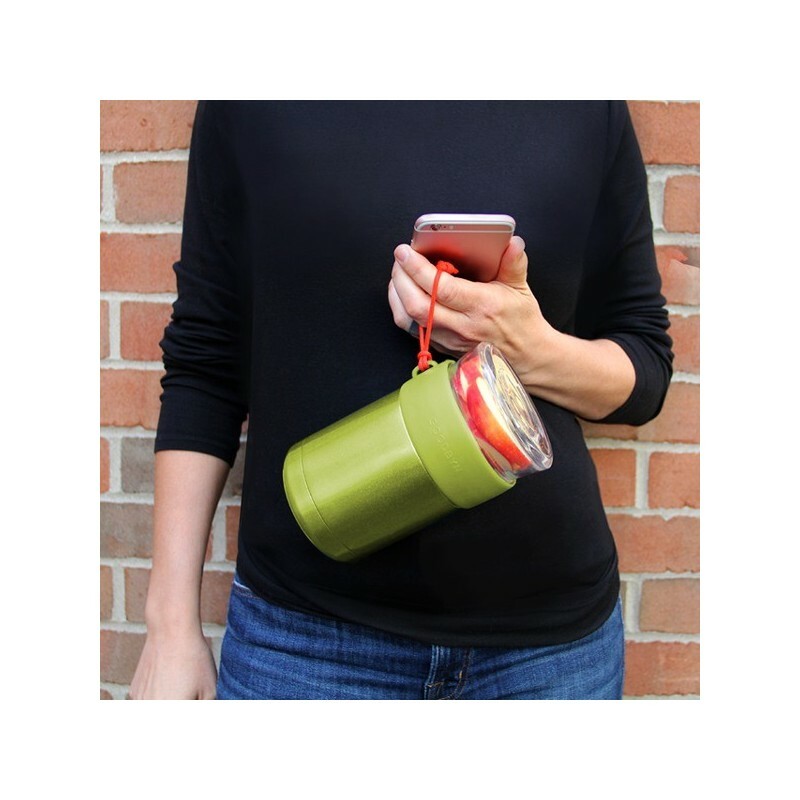 Small carry strap for convenience. Polypropylene plastic (#5 PP), Stainless steel (#40 FE) and Glass (#71 GLE). 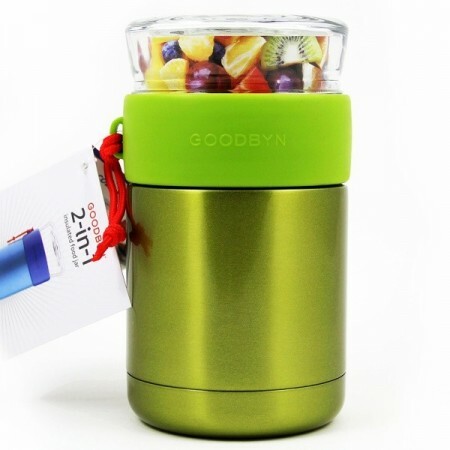 The underside of the lid of the stainless steel compartment and the base of the glass container is plastic with silicone seals. Unfortunately, for the past century, product design has generally take a Cradle to Grave approach, which is a linear model for resources that begins with extracting the resources, manufacturing the resources into products and ends with the product being disposed of in landfill or an incinerator ("the grave"). A Cradle to Cradle model designs products where the components can be continously recovered and re-used, recycled or upcycled. This means designing a product to be dismantled for easier repair, recovery and reuse of the materials.